Vihar in Mumbai city crosses 3000 mms today..3020 mms seasonal total till today morning.. 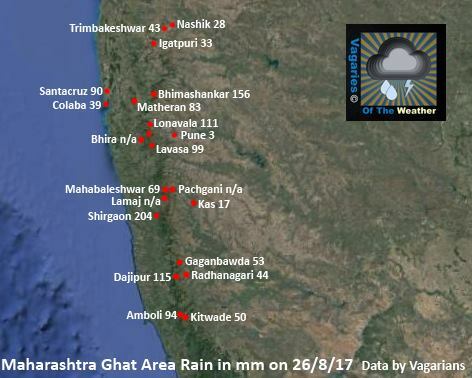 Heavy at Tamhini ghat region ..
Looks like wettest Ganesha Mumbai ever had - non stop torrentials @ Navi Mumbai..
Red alert by IMD over GUJ/MAHA 28,29 ! 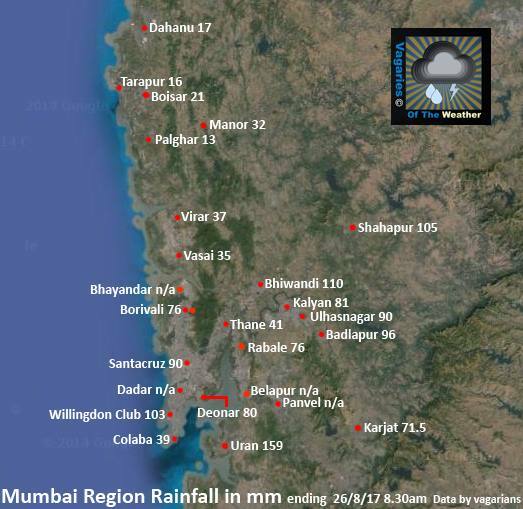 Cyclonic rains over Navi Mumbai infact cyclone may form over North AS/Mumbai/GUJ ? Rajesh Sir, according to IMD's forecast on the night of 26th of Aug'17, " The core of Subtropical westerly Jet continue to pass over Jammu Latitude at 12.5 km above mean sea level". 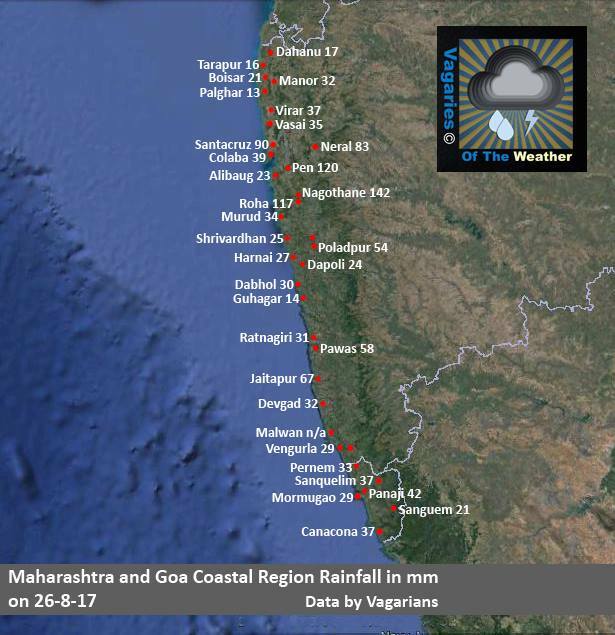 What does it imply and what significance does it bear regarding the SW Monsoon? Is there another low which is gonna travel west towards Maharashtra? Ishan Vajpeyi: The upper most jet streams, should be Easterlies in the Monsoon season upto the Northern regions , Kahmir. 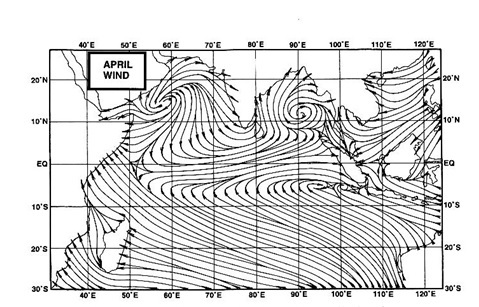 But we see the winds already becoming SW and the core at Jammu is Westerly. Signifies a shift in season within 8/10 days. Deepak Kotian: We in Mumbai got the spell recently (the Friday/Saturday spel) as the off shore trough had strengthed a bit. Mumbai will see a revival soon as the pulse mentioned in Sunday post moves in. Vijith: BB-8 pulse has moved in...another Low ? Maybe possible around 1st Sept but in North Bay.